The Dollar is fairly flat after the non-farm payroll data was mixed. Job growth was at 196k, better than expected. Wage growth was lower than expected at 3.2% year-on-year. EUR is trading at 1.1220 and USDPY at 111.50. Brent is also flattish at 69.20. On the macro data front, this week has US and India CPI. With the Fed and RBI decisions out of the way, INR could meander along on either side reacting to actual flows. Elections kick-off on April 11th and given that polls would be prohibited during the election period, there won’t be much further info on the election outcome. The latest three polls suggest a BJP majority and that is the base case market seems to be going with. At the current juncture, due to potential volatility and lack of clear direction, plain put options for exporters and out of money call options for importers can be more optimal than forwards. USDINR has seen some momentum upwards, as oil breached 70. Brent is now trading at 71.20, on concerns that Libyan conflict would lead to a supply shortage. The Dollar is weak against most currencies, with EUR above 1.1260 and USDJPY at 111.35. Tomorrow’s ECB policy can set the near term direction for EUR. As elections approach, there would be some volatility in USDINR in either direction. Latest polls continue to show a small majority for the NDA, but nervousness through the course of elections could keep INR under some pressure. If Oil continues its resurgence, a move towards 70 cannot be ruled out. But some large USD inflows are expected soon ( such as the Vodafone rights issue), which could help keep INR from a large depreciation. Given the uncertainties and volatility, options can be a better fit rather than locking into plain forwards. The short term range on INR continues to be intact. USD is fairly flat against EUR, at 1.1261 and JPY is a bit stronger, trading at 111.20. US yields are mildly lower as US equity markets saw some losses. IMF lowered the global growth forecast to its lowest in a decade, and that soured sentiments. Also, the US JOLTS job openings came in at much lower than expected, triggering some concerns around the future of the job market in the US. Further, the US has opened another front on the trade war battle and has threatened to impose tariffs on 11 billion worth of EU goods. The EU has announced that they would retaliate in equal measure. Today’s ECB meeting would drive the EUR. While the recent EU data has not been too bad, it is unlikely that the ECB would talk positively and help the Euro. There are enough concerns on the ECB’s plate and the latest US tariff threat is one more in that list. 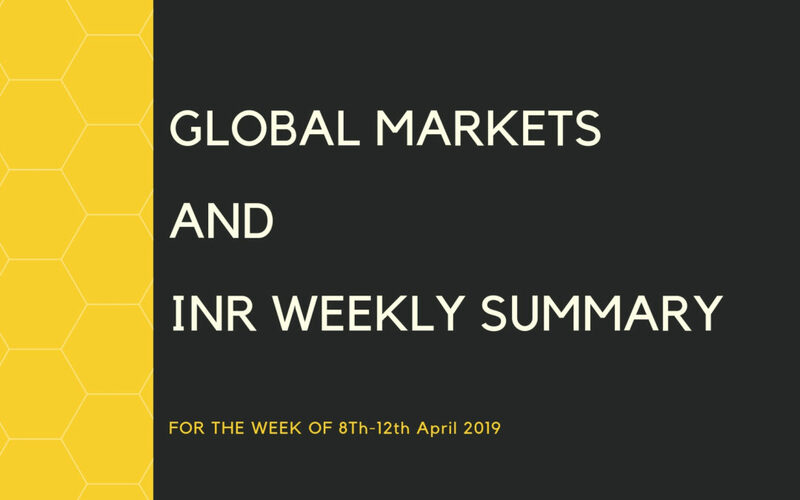 Italy recession concerns, global growth outlook, trade wars etc. could keep the ECB commentary dovish, with a view of bringing down EUR further. Brent has come off from the highs on the back of production and inventory data and is now trading at 70.70. INR would be a helped a bit by this, but the general volatility could remain, making option strategies more optimal than plain forwards. The Dollar ended fairly flat after loads of data and macro events. ECB policy went fairly as expected, with them indicating no rate hikes in 2019. EUR did come off a bit after the meeting, but no significant move ensued. EUR is trading at 1.1275 after trading a low of 1.1235 after the ECB policy. Minutes of the previous Fed meeting, released yesterday, gave a picture of a dovish Fed willing to wait it out. But, they did not signal any rate cut possibility either. Finally, the US Core CPI came in a tad lower than expected (2% against 2.1% expected). There are no inflation pressures yet in the economy and hence no threat to the Fed’s dovish stance. GBP is fairly unmoved, even after the EU agreed to a Brexit extension till October. May now has to convince the UK parliament as to why a long extension is needed. GBP is trading at 1.3090. Brent is trading higher at 71.62. INR is stuck in a range as the first phase of elections start today. After the sharp appreciation of the previous month, INR is well balanced between large flows on one hand and a general sense of caution and risk aversion on the other. The longer the Rupee stays in the current range, the more violent its next move can be. If elections are very favorable to the BJP, INR has the potential for a large appreciation, while a weak verdict can lead to sharp depreciation also. When such large events are on the horizon, option strategies tend to be more optimal than the all-or-nothing forward. The Dollar is stronger against most currencies, except EUR. JPY fell sharply, with USDJPY trading higher at 111.80 level, as US yields rose due to good PPI data. Other currencies such as AUD and CAD also fell against the strong Dollar. EUR is at 1.1280, Brent is trading below 71. INR continues to move with some strengthening bias within its broad range, as calm in global markets continues and on lack of any trigger for a large move either side. As we keep reiterating, option strategies make more sense in this market as the structural, medium-term direction is not yet clear due to the election event and it is optimal to keep choices open rather than lock into forwards.